Hanging your new smart TV on the wall may seem like an easy task, but things can easily get awry unless you have the best spirit level. Having a reliable tool is, indeed, crucial if you want to achieve flawless results in multiple household projects. It comes in handy when you’re hanging decorative objects, cabinets, shelves, as well as when mounting tiles. Like with anything else, the market spoils you with choices when it comes to picking a spirit level. The only thing is that unless you’re an expert, it’s hard to tell the difference between a worthy and a useless one. Luckily, we’ve done the hard work for you. So, if you’re in the market looking for the best leveling tool, check out our top picks below. 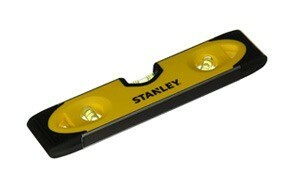 The Stanley 43-511 is undoubtedly the best spirit level on the market. It comes with a heavy-duty aluminum frame that ensures accuracy and durability, but the true star of this tool is the bi-material body with rubber end caps you can seamlessly use on all types of surfaces. Indeed, these rubber caps are developed specifically to protect finished work surfaces from scuffing and scratches. An open top-read vial allows for easy readability. Another thing we like is the presence of vertical and diagonal levels too, which make the tool perfect for most precision tasks. Suitable to use on rounded surfaces, the level also comes with a pipe groove. Built for accuracy, durability, and easy to use, capable to withstand heavy-duty applications, and allowing for hands-free operation on metal surfaces, this magnetic torpedo level can easily satisfy all your needs. Make sure you always keep it handy in your tool box. The I-beam by IRWIN Tools is one of the most accurate spirit levels out there and serves its purpose wonderfully on all surfaces. Its rigid construction ensures durability, and this tool promises to stay by your side for quite some time. A V-groove on its edge allows for a quick pipe leveling, while the rotating dial helps you find the angle you were looking for without any hassle. Straight enough to use as an edge guide, the I-beam brings flexibility and is perfect to use for multiple purposes. Straightforward enough to be handled by a novice and accurate enough to satisfy a contractor, this is without a doubt one of the best bubble levels you could find. Make sure you also check our guide to the best tape measures. Performing, simple to use, and designed for the pros, the Black & Decker BDSL10 can satisfy all users. It’s perfect for hanging objects but can serve purposefully any leveling project. The feature we like most is the Gecko grip pads designed to prevent slipping. Thanks to this feature, the level allows for safe handling with just one hand, and it will never leave marks on your walls or surfaces. Rubber end caps provide further protection and increase durability, just what you could expect from such a tool. Two adjustable, accurate mark targets, one on each side, will help you leave guesswork out of the game. Just use them to draw accurate marks exactly where you want to drill your nail, so that you won’t bring unnecessary damage to the surface. Backed by a two-year warranty and helping you achieve surprising results even if you lack most handyman skills, this 36-inches long spirit level undoubtedly deserves your attention. This will be your favorite tool from your tool backpack. When the budget’s tight,but you still need a reliable level, the Kapro 227-08 could be the one you were looking for. Coming at a more than affordable price and presenting most features you could expect from a best in class pick, this tool may be perfect for your tool bag arsenal. It may not be as long as other levels, but at 9 inches it still does its job wonderfully. Perhaps the best feature in the magnetic V-shaped groove that allows you to work hands-free when leveling metallic surfaces. We also like the injection-molded acrylic vials. The tool has three of them and determines horizontal, vertical, as well as inclined plans. If you’re worried about damaging your surfaces, know that the tool comes with rubber end caps designed to absorb shocks, protect the vials, as well as your finished surfaces from scuffs and scratching. Another nice thing is the molded plastic body that allows for hassle-free operation. It may lack length and doesn’t come with all fancy features, but if you’re only using a level occasionally anyway, this is the best budget level you can find. The Goldblatt is one of the most performing torpedo levels. Constructed for the pros, it comes with all needed to perform accurate furniture placement, building measurement, or any other tasks in which leveling is essential. Everything about this tool is superlative, from the aircraft-grade aluminum construction to the machined top and bottom surfaces. The tool comes with three level vials, allowing you to perform all kinds of tasks. If you’re worried about seeing or reading the level, you’ll like to know that the central vialis magnified. At the same time, the tool uses a patented Verti-site vial design that allows you to read it from the side. All these features make the level perfect to use in confined spaces. At 24-inch long, it’s also compact enough to fit in most spots. Clear and intuitive markings at 0 and 90 degrees bring further value for money. Then, the die-cast aluminum anodized grit blasting delivers a comfortable hand feeling and makes the surface non-slippery. Ideal for the pros and packed-load with features, the Goldblatt comes in various sizes or in a spirit level set. 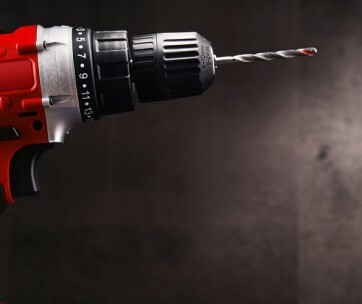 Be sure to also check out our list of the best cordless drills for more great items like this. Whether you’re a pro or just an amateur looking to take his skills to the next level, the HAMMERHEAD 24’’ Digital Level with Laser may surprise you. This tool is designed for accurate measurements at 1/10 and 1/20 angle degrees in either level or plumb position. This laser spirit level takes truly accurate measurements thanks to the dot projection which is visible from 100 feet. An easy-to-read digital display not only shows you the results, but it even allows you to select the unit in either degrees, percentage, or inch/foot. One of the features we like best is the durability of this tool, given by the aluminum base. A ruler scale and strong magnets also increase accuracy and let you work hands-free on metal surfaces. Another fabulous thing is the memory function which recalls the last nine angle measurements. An audible indicator at 0, 45, and 90 degrees, as well as at the last recorded angle provide further aid in hanging your latest plasma television or shelves like a pro. Our handy guide to the best nail guns features more great products like this. Manufactured by Stanley Hand Tools, the FatMax 43-524 is an outstanding manual non-magnetic level ideal for those who’re after no-frills operation. Getting an accurate measurement couldn’t get simpler, regardless of your level of expertise. Worthy of standing among the best spirit levels out there, the FatMax features two block vials on each end, as well as a central MaxEdge vial which enables users to draw continuous lines without hindering view. Durable and dependable, the tool comes with dual bi-material hand grips and two shock-absorbing caps at each end. Furthermore, the non-marring side bumpers increase durability even more. Easy to handle, well-balanced, and durable, the FatMax 43-524 is one of the best tools to have in your arsenal. Love tools? Check out our review of the best digital calipers for our top picks. When one bubble level is not enough to satisfy your craftsman aspirations, the Workpro 3-Piece Spirit Level Set could be a suitable alternative. It comprises three lightweight yet durable tools designed to meet all user needs. One of the handiest is the 9-inch spirit level with milled measuring surface. It’s designed to fit in most spaces and features a strong 4-piece button magnet. This level is ideal for all those precision measurements you have to make in tight spaces. The other two levels measure 12 and 24 inches respectively. They have a standard beam-frame design, but their smooth sides make the difference between an average product and these. You can use them on any surface without worrying about scuffing and scratches, but that’s not all. Each level comes with integrated magnets, so you can keep your hands free when aligning metal beams or posts. Furthermore, the longer levels also come with three vials, one on each side plus a central one for accurate measurements and aligning. Packing a wealth of features and coming at a truly affordable price, this set can undoubtedly satisfy most needs. Find more great products like this by checking out our guide to the best screw guns. 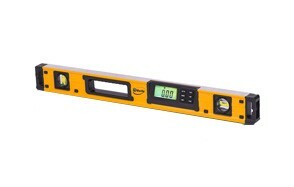 The best feature of this digital spirit level is itspinpoint precision. Shefio Professional Digital Magnetic Level takes the leveling game one step further by using a digital level angle finder. It returns extremely accurate results at 0 and 90 degrees so that you can leave the guesswork out of the picture. Its magnetic function promotes hands-free operation when mounting metal shelves or beams. Another thing we truly like is a dependable and durable construction. Shefio knows that job sites conditions are not always ideal; that’s why it build a tool capable of withstanding any challenge. This level is not only IP54 rated; it’s also dustproof and resistant to collisions. Other perks include a low battery indicator and a memory function that stores your last eight measurements. Backed by a 1-year manufacturer’s warranty and 100% money-back guarantee, this is undoubtedly an excellent tool for your arsenal. 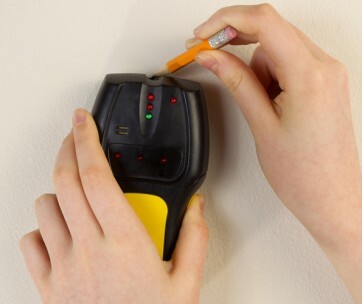 If you are looking to upgrade your tools, then make sure you read our stud finders review. If you’re after a no-frills magnetic level for your toolbox, look no further. The Sheffield 58640 V-Groove Torpedo Level brings minimal wallet damage and a host of benefits. Perhaps the most attractive feature is the utmost accuracy. Know that you’ll be able to achieve precise measurements within 1/32-inch, so that your wall art, shelves, or cabinets will never look inclined. Another feature you’ll love is the magnetic design that’ll let you use the tool hands-free on metal surfaces. A patented self-centering magnetic V-groove edge allows you to level pipes and tubes too, but the benefits don’t end here. We also like the protective end caps designed to protect your surfaces from scuffing and scratches. Hanging a shelf or a TV on your freshly painted wall won’t be a pain anymore, and what you’ll achieve is a perfect, flawless result. This also makes a perfect DIY gift for your loved ones. Kapro is one of the most popular names in the tool industry. The brand’s renowned for the quality, durability, and longevity of their products, and things are no different with the 170-82-24 Samson Contractor I-Beam Level. This one’s designed to help you determine horizontal, vertical, and inclined planes with utmost accuracy. Its injection-molded vials resist breakage and have a sensitivity of .001-inch. The dual-view plumb vial can also be read either from the top or from the side, giving you unrivaled job site flexibility. The frame is also important to check, and this contractor I-beam lives up to the expectations. It’s made from lightweight yet corrosion resistant aluminum and milled for accuracy. Handling and transporting this tool is also easy thanks to the convenient soft handgrip. Ergonomically shaped and lined with rubber, the anti-slip grip reduces fatigue and helps you reach the expected results. For more tools check out our guide to the best screwdriver sets. 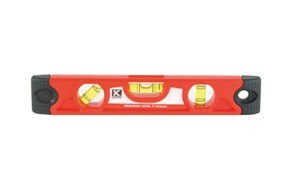 If you’re a professional or aspiring contractor, another spirit level to consider is this one from OX Tools. The Heavy-Duty Box Level comes with a plumb site vial viewer that allows you to read it from a frontal position. This translates into the elimination of parallax error, boosting up efficiency. If leveling objects faster is not enough, know that this level comes with other advantages too. On the one hand, we truly like its construction. This tool is made from bi-material and comes with air-cushioned, shockproof end caps. These protect the level from collisions, maintaining vial and level integrity. We also like the dual handles, both of which feature ergonomic soft grip. Furthermore, the rubber coating also lessens the slipping of the level when working in wet conditions, which is great. Coming in magnetic and non-magnetic variants and various lengths, this level can easily satisfy pros and DIYers alike. 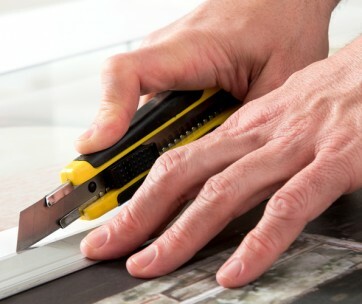 Don’t forget to also check our guide to the best utility knives. Bringing three measuring ways and solid quality, the TACKLIFE Aluminum Alloy Magnetic Torpedo Level is another outstanding spirit level to consider. Its simple design addresses most users, and you might just fall for it regardless of whether you’re an amateur or contractor. The first thing to notice is the sturdy aluminum alloy frame protected by TPR soft rubber at the ends. This shock-resistant construction ensures both longevity and accuracy. Fairly compact for a job site tool, this torpedo level is also perfect to use for steel construction work. Its strong magnetic side lets you attach it to a surface for hands-free operation. But the unit brings benefits to homeowners too. If you only need a level to hang decorative objects or furnishings, this one is still the right level. A ruler on the bottom side with imperial and metric marks will help you achieve perfection during each project. Colored in orange so that you can easily spot it on the job site and featuring a hanging hole for no-frills storage, this is undoubtedly a great spirit level for your arsenal. Another spirit level that has made it to our list is this magnetic spirit level from Gunpla. Crafted in aluminum allow and going up to 48 inches, this tool is perfect for multiple uses, either at home or on the job site. The thing that strikes the most is the premium quality of the construction. The level has a sturdy appearance and promises to stay by your side for long. Smooth lines and a ruler ensure utmost accuracy, project after project, while the three measurement vials help you achieve precise results. Due to its magnetic design, the level is also perfect to use for steel construction works. We also like the large handhold grips that are wide enough to ensure smooth handling even when you’re wearing gloves. Backed by a 1-year warranty and benefiting from US customer support, the Gunpla spirit level is great for DIYers and contractors alike. Deciding which products to test is often exhausting, majorly due to the high volume of options on the market. It’s near impossible to try every choice that there is, so we always narrow down our search by considering general opinions and product ratings as well as the product’s value for money. Reviews – User reviews are our go-to source for deciding which products are worth trying. Things were no different when it came to picking our spirit levels. We read and weighted in dozens of reviews and consumer opinions before deciding which levels were worth of our attention and which we’d better skip. Price – Once we narrowed down our list to the best spirit levels based on their reviews, we trimmed it some more by throwing in the price factor. It’s hard to decide what is a fair price for a spirit level. A DIYer might do just fine with a cheap option, whereas a contractor may need a more performing but also more expensive tool. To make sure you can find the right level in the list above, we only included those levels that bring true value for money and that are fairly accessible to anyone. Now that you know how we chose, you might wonder how to narrow down your search from ten to just the best spirit level for you. When it comes to precision tools, subjective factors such as color and shape are irrelevant. Instead, you should weigh in the following criteria. Bubbles – Undeniably the most important part of a spirit level is the bubble. It shows you when the level’s achieved, helping you hang your objects accurately or build a house that looks good. Almost all tools come with a horizontal vial that allows you to reach a level on horizontal planes. If you want more than that, know that the best tools come with three vials that also let you make vertical and angle measurements. Accuracy – Nothing is more annoying than using a bubble level accurately only to see that your objects don’t align the right way. Checking accuracy is fairly simple though. Place the tool on a hard surfaceand note where the bubble ends up. Flip the level end over end and read the measurement again. If the level is accurate, the bubble must fall in the same place. If it doesn’t, just bin the bad level and go get another. Magnetic Strips – Whether you want to mount metal shelves or racks, or if you are involved in steel constructions, a level with magnetic strips will allow you to work hands-free when leveling metal objects. These strips also let you store the level on a metal panel in your workshop, helping you save space in the toolbox. Lights–A nice perk to have on a bubble level is lights. There are only a few brands that use them, but getting a tool with LEDs is a real lifesaver if you have to work in tight or poorly illuminated spaces. These lights are usually positioned around the vial and light it up with the touch of a button so that you won’t have to struggle reading it. Besides lighted vials, you may also make good use of a laser function that projects a beam of light on your surface, letting you work without holding the tool. Size – Getting a level of the right size is also crucial if you want to achieve perfection. Spirit levels come in an array of sizes, from as little as 9 inches to 48 inches or more. If you’re a DIYer who needs the tool mostly for hanging wall art and cabinets, perhaps a 24-inch level is the best. At this size, the tool is small enough to fit in tighter spaces yet long enough to help you speed up your project. If you want to level pipes or tubes and need a tool to fit in really tight corners, a 9-inch level could be a more appropriate choice. For big jobs, on the other hand, such as floor installation or construction works, we recommend getting the longest level you can handle. Knowing how to choose the best level spirit for you is a good start, but before making the final decision, you must also determine whether you want a traditional or digital tool. Bubble/Spirit – The traditional bubble level is the simplest type you can find. If calibrated well and used correctly, it’s as accurate as you need it to be for any project. The only thing is that if you’re not a contractor, using it correctly can be difficult. If figuring it out on horizontal surfaces is somehow easy, knowing when it’s exactly level or plumb can be tricky especially when you’re working vertically or need to mount something at a precise incline. Digital – There is a common misconception that digital levels are much more accurate than the traditional ones. We’re sorry to spoil this for you, but they aren’t. The main difference between the two is the ease of use. Digital levels may make your task less of a hassle if you’re new to handling this type of tool. Measurements are clearly displayed on a screen, and the tool can even save your last measurements in memory so that you can check accuracy. Digital levels are particularly handy for vertical and angle measurements. It can show you angles or slopes as a percentage, fraction, or decimal and emits an audible signal when you’re approaching a level so that you can keep on measuring without even watching the display. Many digital levels also incorporate additional features, such as lighted vials or laser guides. And even if traditional contractors may be reticent in using these, trust us when we tell you thatall these perks can be a real lifesaver for a DIYer.